Look out over the stunning rhododendron-filled vistas at Craggy Gardens, see the “Seven Sisters” mountain peaks towering over Black Mountain’s Lake Tomahawk and discover the grandeur of the gardens at Biltmore. 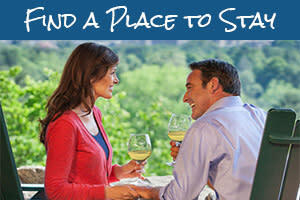 You now can have all these experiences before you ever arrive in Asheville for your visit! 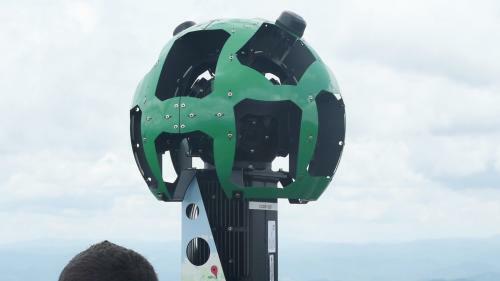 Through a partnership with Google, Explore Asheville has helped to create interactive, virtual tours of more than 20 iconic area hikes and destinations. 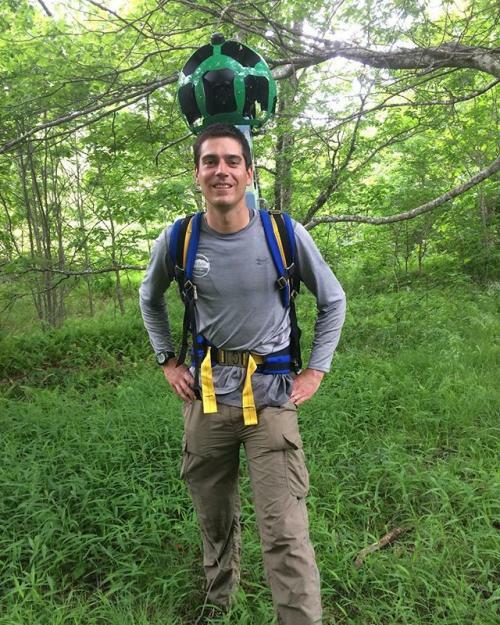 Our team of hikers utilized a high-tech piece of equipment with a computer and cameras, known as Google Trekker, to capture 360-degree images that you can navigate on your computer or phone. These images are just like what you’d see on Google Street View. The only difference: we&apos;ve taken Google Street View to trails where cars don&apos;t drive! 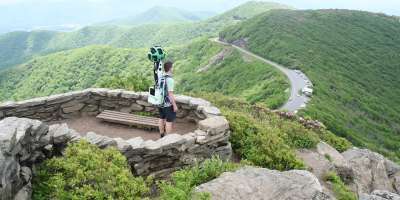 Asheville locals helped carry the Google Trekker by foot from place to place over the course of about two months. Thanks to those efforts, for the first time, you’ll be able to use Google Maps to experience these beautiful Asheville locations from the comfort of your own home as you plan your mountain getaway! The Google Trekker comes in the form of a four-foot tall, 40-pound, high-tech backpack that really looks like something from the future! As you can imagine, the Google Trekker was a real head turner while we were out and about and drew quite a few questions from the people we met along the way. The backpack contains a computer, batteries and memory cards. Rising from the backpack is the mast, which sticks up 2-feet above the shoulders when wearing the pack. At the top of the mast is a giant globe that holds 15 camera lenses. Each camera takes a photo every 2.5 seconds! The photos are recorded on a hard drive inserted into the backpack. The hard drives are sent to Google, where the thousands of photos are stitched together to create the panoramic images you’ll see. The locals carrying the Trekker had to get creative at times because of the size and weight of the Google Trekker. Those creative maneuvers included carefully navigating under trees and through tight spaces along the trail. 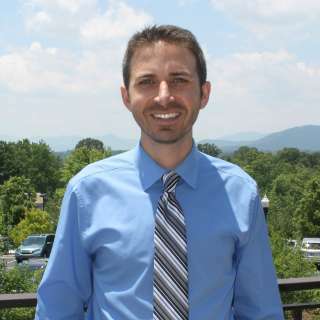 The primary “trekker” was Asheville’s Evans Prater, who founded and owns the local outdoor gear company, Mount Inspiration Apparel. Evans knows a thing or two about trekking through the mountains. After all, in 2014, he hiked the entire Appalachian Trail -- more than 2,200 miles! 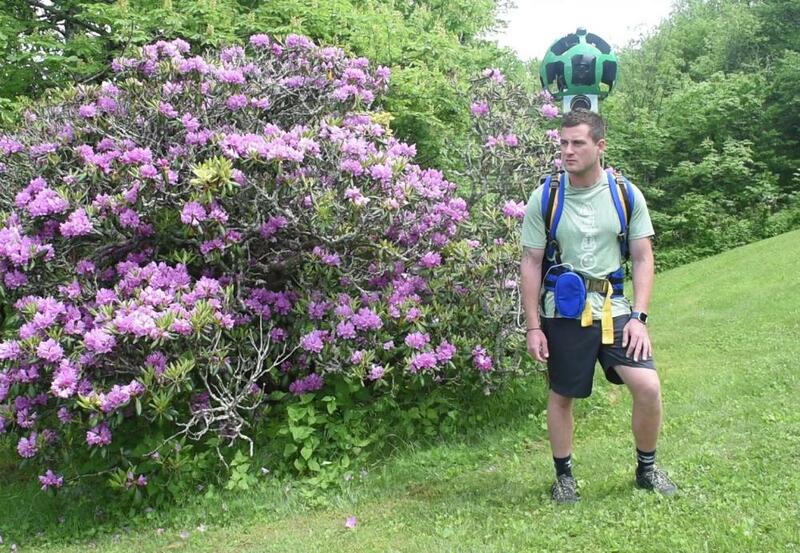 Even so, he says, hiking with the Google Trekker was unlike anything he has experienced. “When you’re backpacking, normally you’ve got it (the weight) all compressed right on your back but the Trekker goes far above your head,” Prater said. “It’s just been really great to be outside, be hiking and seeing all the beauty around here." Evans hiked dozens of miles with the Trekker and traveled to nearly 20 area locations. Several other brave hikers from Asheville joined Evans in the effort. Those hikers included John Haffner. Haffner is an environmental scientist who loves to explore the world on foot, so carrying the Trekker was right up his alley. He has walked the Appalachian and Pacific Crest Trails with his wife, Christine. 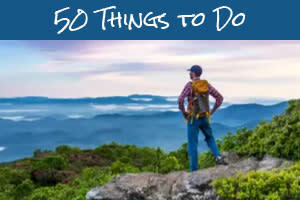 In Asheville, they love to show visitors around the mountains as guides for Blue Ridge Hiking Company. The nearby town of Black Mountain also has been a partner with the project, with Jill Edwards and Ryan Moody carrying the Trekker on behalf of the city’s Department of Parks and Recreation. Click on the tiles below to see what they&apos;ve captured!